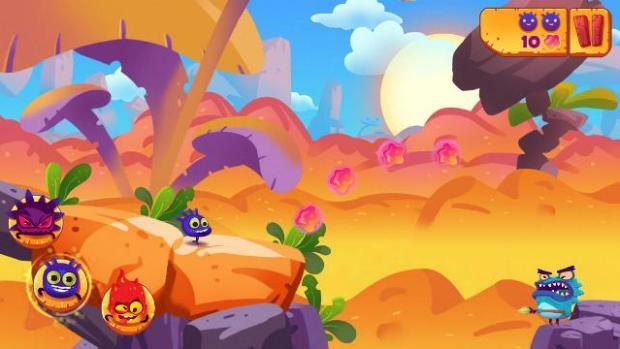 Bright, cartoon-style platform games seem like the ideal fodder for handheld gaming, and yet the control system of touch-screen mobile devices has always created something of an issue in these titles. 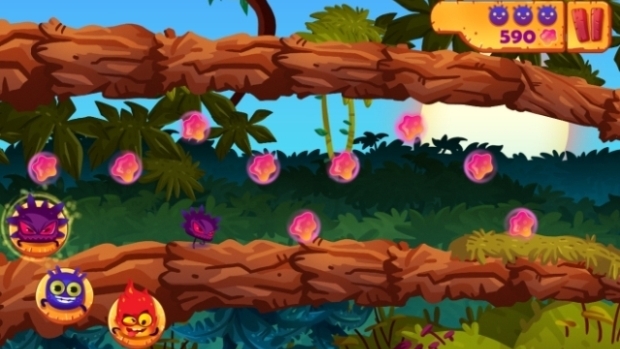 So it comes as no surprise that more and more developers are eschewing the idea of virtual control pads or joysticks, and instead following the successful footsteps laid out by Ubisoft in Rayman Jungle Run – with forward momentum being a fully automated process. By taking basic movement forwards out of the hands of the gamer, it allows us to focus much more on gameplay than getting bogged down in control issues. Romanian development studio Pixel Trap have taken hold of this freedom and introduced a choice of playable characters, with multiple paths through the forty stages on offer in Mighty Adventure. 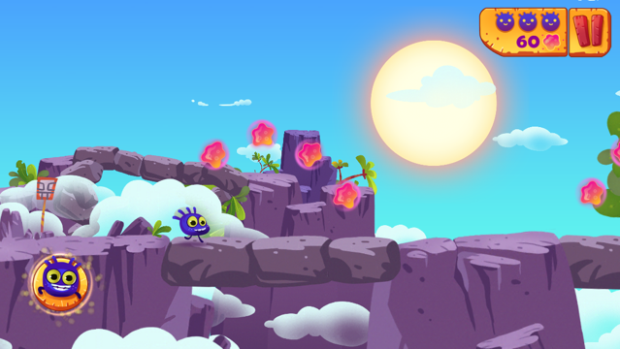 Players quickly meet the three strange creatures, and shown in brief tutorials how each has a different unique skill that will help them traverse the levels in their own way. One can double jump to reach higher areas, one can perform a slam move to smash through week floors or bounce off the heads of enemies, and the last can perform a fast dash straight forward, destroying objects in its path. There is very little story to speak of: you are shown through a series of still images that an old character (presumably a town elder or relative of the heroes) has been kidnapped by an ugly monster, and the trio of friends set out to rescue him. This is as loose a premise as possible, but is standard fare for a platform game really, and in true Mario Bros. style. After this, the levels are all just standalone stages, tasking players with reaching the end goal with as many star collectables as possible and with four lives to account for mistakes. Most of the levels are very similar to each other and there is a distinct lack of variety or excitement in the gameplay. As mentioned previously, the different skills of the three creatures open up different pathways through each stage. You can easily switch from one to the next with a quick button tap (with the handy option of switching the button to the opposite side of the screen for left-handed players). If you spot a deep descent, you could simply follow the path downwards for one route, but perhaps the dash skill would help you cross the chasm in one swift move and reach a higher platform. This makes the levels more interesting, and you won’t find the best route through at your first attempt; in order to grab all the stars on that stage you will have to re-play it a few times. Depending on how many stars you collected in the stage, your performance is rated as one, two or three stars. The stars you collect don’t have any bearing on your progress in the game however; they are not required in order to unlock later levels and they don’t form a sort of in-game currency – it seems that this star rating system has simply been employed as a mechanic to get you to re-play levels and score as highly as possible. 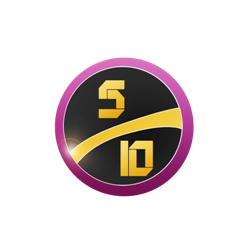 This is most likely down to the fact that you could easily breeze through ten levels in a matter of minutes, and without the star ratings this would be a very short game with nothing to offer any longevity. The graphics are bold and bright, and the music suitably bouncy for a fairly inoffensive platformer, but it isn’t likely that you will remember either for very long. The characters – be they enemies or friends – are all fairly derivative blobs, and there is nothing really done to add personality or atmosphere to proceedings. One short-coming is definitely the camera movement: as the protagonists are constantly moving, the camera should be too. Sadly though, all too often the screen cannot keep up with the action, meaning you can’t actually see far enough in front of you to know which obstacle is coming next. This issue sometimes reduces the game to a trial and error affair, as you simply cannot judge what to expect on your first play through. VERDICT: Despite Pixel Trap making the wise decision not to spoil their title with virtual controls, Mighty Adventure just doesn’t do enough to set it aside from a plethora of other cartoon-style platformers. Whereas other games develop and change as you progress through them, Mighty Adventure is a pretty one-note affair. You have really seen everything it has to offer after the first few levels and the only impetus to carry on playing is to collect stars, which have no actual use within the game. This isn’t the sort of title where players will want to compare high scores and leaderboards either, so it is likely that most won’t stick with the lacklustre gameplay.